It's a very pretty city, full of great architecture, and the beautiful Danube sweeping through the city, dividing Buda & Pest. 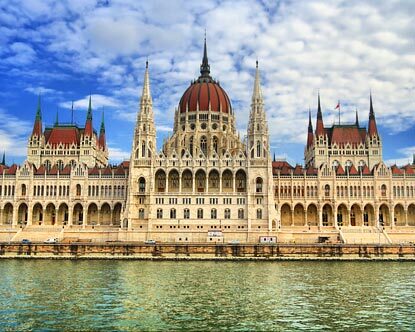 There are, of course, lots of bridges (including one called Elizabeth Bridge), and they have a really amazing Parliament building. Can you believe that's a coffee shop? It's in a bookstore - compare THAT to your average Chapters + Starbucks!! There are oldie churches and monuments to St Stephen (who accepted Christianity for Budapest) but we took photos of us reading "The Paperbag Princess" and one of a woman stuck in 1986 photographing her family in front of the statue. Check out those Mom Jeans!! And she had that awesome sweep-up bangs look going on. Added bonus: fanny pack. WOW. Budapest is also home of one of the most amazing & complete zoos I've ever been to. In the same zoo, they have: giraffes, zebras, lions, leopards, rhinoceroses (!!! I had never seen one before!!! ), peacocks & birdy birds, gorillas, those giant tortoises, seals, dolphins, brown bears, POLAR bears, lemurs, monkeys, orangutangs, a full aquarium, degus, a tapir, hyenas, marmosets, you stinking NAME it, it's at the Budapest zoo. Dr Faff is looking for the Polar Bear while Eliz was watching the seals swimming. The last things Budapest is known for is meat-based meals. Elizabeth is truly her Daddy's daughter, and was happy with this diet. I prefer the liquid diet of beer. So much more refreshing, no? i laughed at the lady stuck in the 80's! where can i get some of those mom jeans in that capri style? Your trip looked amazing georgina! On The Road Again: 143 miles, 4 and a half hours.